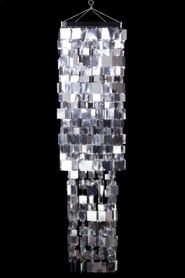 Our "Fabulous" 3-Tiered 8 Foot Long Bright Metallic Silver Chandelier is a problem solver in the following ways: It will fill a ton of air space. It costs a fraction of similarly sized items in the market. Instead of heavy acrylic, we've used lightweight metallic PVC sheeting. it's shiny and moves with the slightest breeze. It hangs in minutes. It stores flat. it's EIGHT FEET LONG! Should we go on?! You'll use this fantastic chandelier over and over and over again. . We offer Light Cord Kits (sold separately),you can add our LED Light Discs to the top (we have many varieties, including color changing styles), or you can simply hang it as-is and use it as a huge decoration. 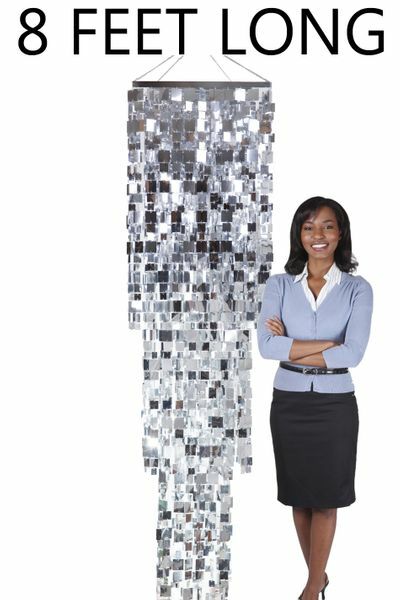 This fantastic piece features 3 tiers of metallic silver flexible metallic PVC squares alternating from 1.25" to 1.5" to 2". The outside tier is a 2' diameter square with 44 strands that are 41" long. 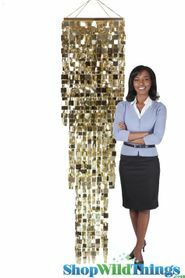 The middle tier is a 1.5' diameter square with 32 strands that are 67" long and the inner tier is a 1' diameter square with 24 strands that are 98" long. VERY FULL! Each square is attached to the next with silver metal jump rings. Hanging chains are attached at the top. 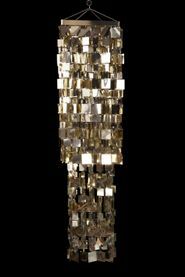 We also offer this item in a 4 Foot Long Version as well as in other colors like Light Metallic Gold. What a beautiful / awesome / cool, difference the Fabulous Square Chandeliers made at our event. Thank you for offering such an easy to use web-site and for superior customer service.